Another Friday, another new place to head to for lunch with Jeanette and the boys. This time, after reading online reviews and having went to do take-aways there with Marcus before, I requested to go to Good One Restaurant in Vic Park. It is a Chinese place selling mainly roast duck, roast pork (siew yok) and barbecued pork (char siew). 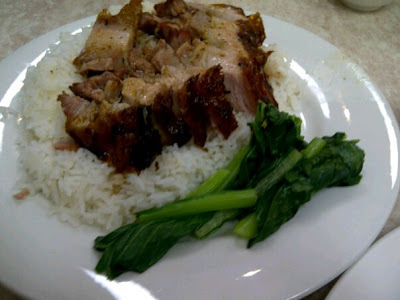 Reviews raved about the roast duck and I know Marcus liked their siew yok. I was a pig, major. 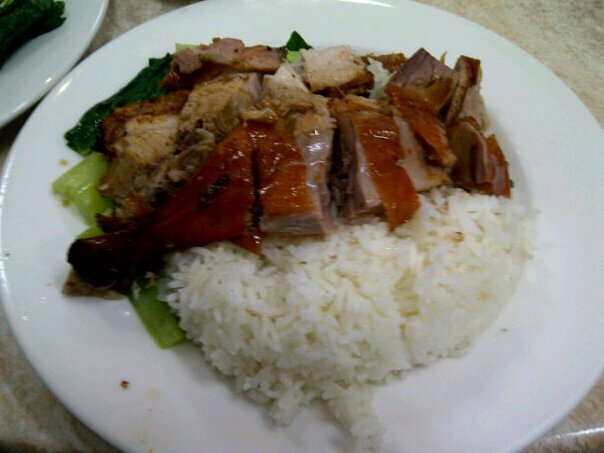 And ordered the plate above: combination rice with siew yok and roasted duck. I am so happy I got the drumstick part too. Yums. Jeremy and Steven ordered just the siewyok rice, Jeanette ordered the roast duck noodles and Sam 'ordered' the green veg. They smell good and look good. Unfortunately, I cannot bring myself to say they taste yummy too. Because well, they aren't too well done. The siew yok was abit tougher than I thought and I don't like how the crispy skin sticks to my teeth. The plate of veggies we got was also not good because it was presented in such a slipshod manner. Bleagh, so not appetising. So please order anything else besides the veg with oyster sauce. There were barely any oyster sauce. The roast duck was alright but nothing to be wow about. However, the table next to ours ordered the sweet sour pork, some kind of noodles and other dishes which look really appetising. I wonder if it is because of the crowd. Oh wells. Maybe one day I will give it another chance and go back again. Meantime, I will be off on another search for better siew yok in Perth!